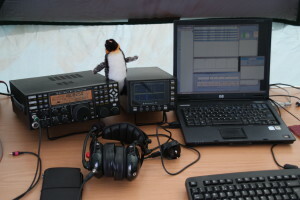 July saw the annual return to Guernsey for the IOTA Contest, although this year certainly felt different with the loss of Louis 2U0FER, however we promised ourselves we’d carry on the trip. The trip as always starts with the travel across 3 days before the IOTA Contest, this meant that Paul (M0TZO) and I flew out of Gatwick and Iain (M0PCB) took the boat with a large amount of the gear we would need to put the station on air. On arrival Tom (2U0TKB) met Paul & myself at the airport and transferred us to Les Maingys Activity Centre (Scout Camp) which isn’t too far from the old camp site however this change meant that we didn’t have to operate the contest from Rousse Point but the biggest bonus was a huge field and power no generators needed this year thus less faffing about! After dropping kit off we headed into St Peter Port to pick up some local sim cards (No ThreeUK Feel at Home on Guernsey!) one for keeping an eye on work (magicbug) and another for the D-Link 4G router we planned to use for DX Cluster and general web access, after that we headed to the pub to wait for Iain’s ferry to arrive into the harbour before going for lunch as a group. Once back at the campsite we started to unpack and setup the station, what we didn’t expect was the amazing help from the local radio amateurs, who wanted to make sure we had a fantastic and stress free time. 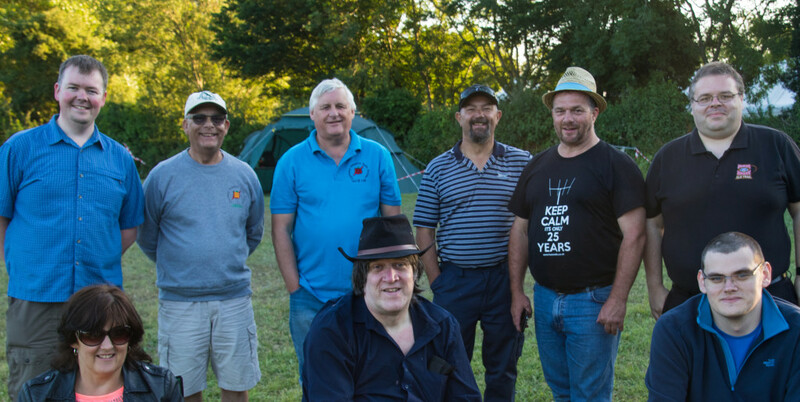 On Wednesday a large number of the Guernsey ARS turned out to help set up the antennas and have a BBQ with us. 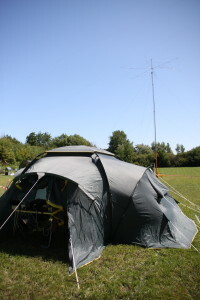 This meant on day one we had a Hexbeam, 80m dipole, WARC band dipoles set up and running inside the operations tent and that evening Iain and myself hit the bands to see what conditions were like resulting in around a 100 QSOs each. 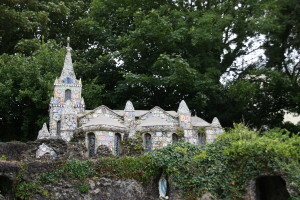 Due to the lack of needing to-do much Thursday meant we had time to go back into St Peter Port to have a look around the shops & port to see what tax free goodies we could purchase and frequent a few coffee shops for a drink or two. That evening we managed to put the 40m dipole up and hit the bands again as 2U0SQL & MU0PCB for a bit before retiring to the pub down the road for a few drinks before we called it a night. Friday with nothing antenna or radio related to complete we decided to hit the bands before heading out for a nice lunch after that we had a quick trip to Rousse point to enjoy a relax at the Kiosk. Friday evenings are the Guernsey Amateur Radio Societies meet up so we joined them at the bunker for a chat about plans and what we’d all been up to since IOTA 2014 and also borrow a usb to serial adapter after we forgot to pack extra! 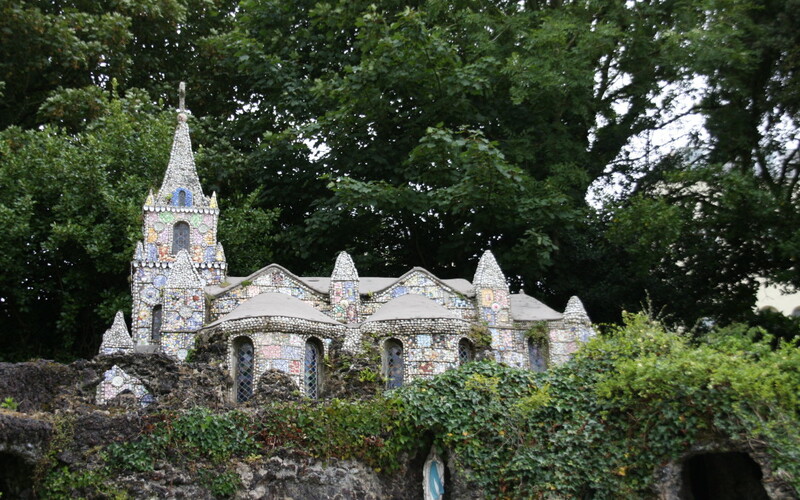 If you’re visiting the island we highly recommend meeting up with the local hams. Saturday morning arrived normally this would mean packing up camp and heading to Rousse Point but this time we didn’t have to the station was set up and ready to go so after a cooked breakfast made by Tom 2U0TKB (Thanks!) 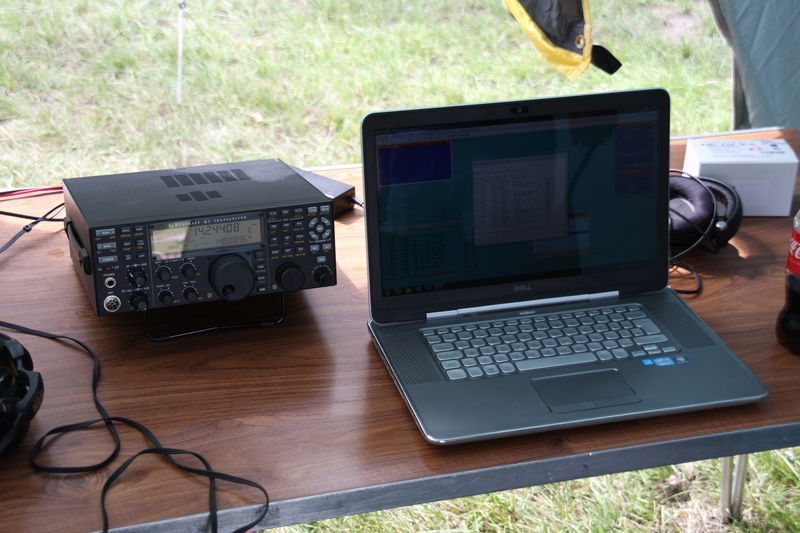 we setup the two laptops for the contest. This proved simple enough running N1MM+ so we didn’t fall foul of serial number issues we suffered during 2013 this was completed quickly with the only problem being clock sync issue this wasn’t a problem after doing NTP sync and running N1MM+ in Admin mode. This meant we still had about 3 hours to kill so again we hit the bands to pass the time, what I found personally was that 2U0 prefix seemed very popular with German stations (Thanks for the QSOs!) so a lot of the time I was running DL pile ups for a few hours. As the contest started Iain was on the run station to operate CW (He’s the only CW op! ), while I operated the multiplier station to find stations for easy pickings this worked nicely with Iain enjoying nice runs for two hours, however we soon found out that 15m seemed poor and 10m wasn’t any better which was evident in the breakdown I was quite pleased after the 2 hour multing slot was over and I switched with Iain. SSB pileups seemed similar to the CW ones although maybe a bit slower but even with 100w we had a steady stream of QSOs going in the logbook and the two hour shifts kept rotating through till 2am between Iain and myself up till 1:30am when I called it quits however by 11pm we’d passed a 1000 QSOs so the target was well insight. This left Paul (M0TZO) and Tom (2U0TKB) to man the station till 5am when Iain got up again for another CW stint before I took over just after 7am after a quick shower (luxury we quite enjoy) this 2 hour operating stint turned into 4 hours however this turned out nice as the first hour on 20m was slow at times but then soon as we hit 8am the rate suddenly jumped up (Europe woke up?) and this carried on till 11am when Iain took over for the final two hour shift taking us to the end trying his best to eke out QSOs on 15m. Between all this the multiplier station was being manned by anyone who wanted to have a go which turned out to be mostly 2U0TKB (Tom), 2U0WGE (Rob), M0TZO (Paul) what we did learn is that we lost quite a few multipliers on 20/15m by not having dedicated antennas for the multiplier station. 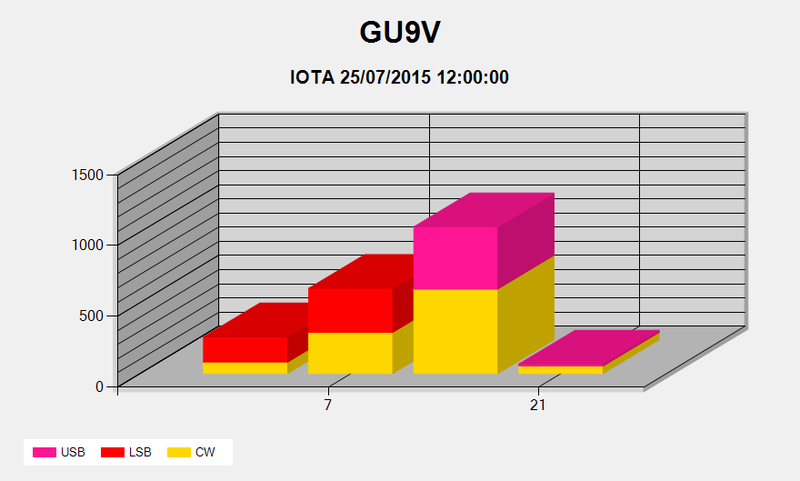 Considering we declared this would be a fun entry it turned out to be an excellent overall result compared to previous entries, this year changing the callsign to GU9V rather than MU0HTJ certainly helped reducing time to send and confusion of people receiving! 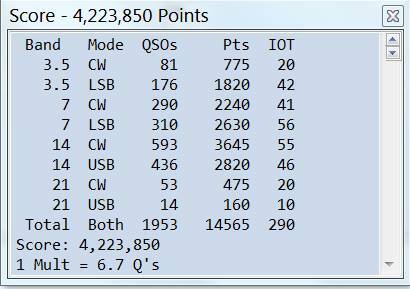 After finishing 1953 QSOs which was actually less than the previous year by one, however we managed to eek out some extra multipliers to provide us with a score of 4,223,850 million which is a difference of 277050. 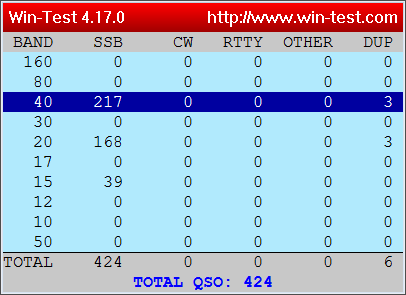 We did have nearly a perfect split of SSB/CW QSOs which means we probably have the rota perfectly aligned this is the second year in a row we have managed this. It was disappointing that we worked so little on 15m but conditions just didn’t seem to allow us to work much more without having a detrimental effect on the QSOs going in the log so focus switched to multipliers only on that band when available. More interesting was that 10m provided zero QSOs for us, looking at the DX Cluster there was some Sporadic-E however we certainly didn’t notice anything of the sort which possibly lost us a few extra points but can’t have everything! We did however see a big improvement on 80/40m which QSOs totals being much higher, we did have a change of antennas switching from verticals to simple dipoles which probably worked to our advantage of working Europe rather than DX either way we aren’t complaining! Overall the main band was 20m, which provided us with most of the day time QSOs although much lower amounts of North America towards the evening as the band seemed to fade out for us resulting in moving to 40m to pick up the easy UK multipliers. What did we learn? Of course there’s always room for improvement although looking at the results this year it looks like we might have hit the limit of huge game changing results in the low power section on Guernsey and the limitations of the equipment available (without taking more masts and bigger antennas) vs the man power available to set it all up. We certainly need to make a more concerted effort to make use of the multiplier radio but at the same time to-do this we need to improve the antennas it has available to use, we’re thinking along the lines of a triplexer on the hexbeam to allow us to share the one antenna across all the radios. Other things could be how we operate during the night there’s a period between 2am -5am where the rate on the run radio drops considerably, this could be also down to experience of some of the operators and improved with guidance and also more confidence to keep calling CQ. The evening was not surprisingly spent back on the air operating using our own callsigns, well the antennas are set up seemed poor choice not to operate. Monday we’d always set aside to-do some touristy things, we did think about going to the Island of Herm for lunch and a explore however with the weather being poor (Wet & Windy) we decided to not to instead opting for another wander around St Peter Port, before having a look at Little Chapel, then the German occupation museum. We did hope to have a look at the German Underground Hospital but sadly it had closed due to loss of power (maybe next time). 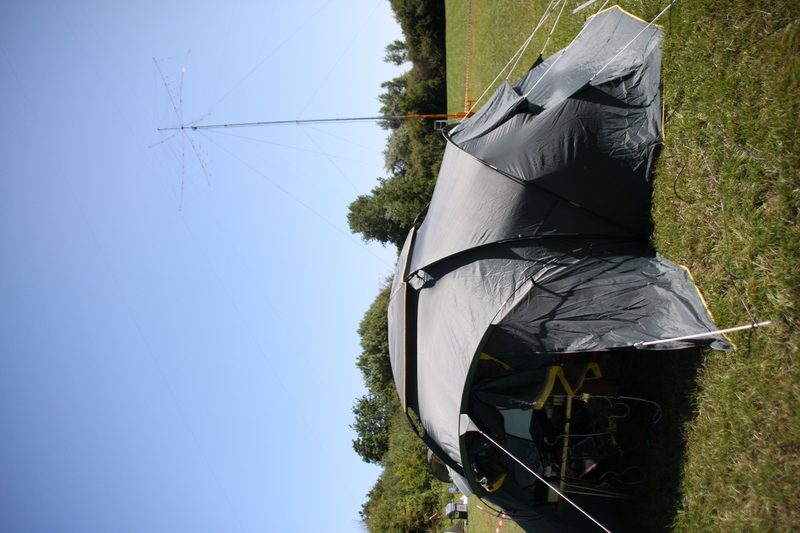 Monday evening and Tuesday morning was of course spent packing down antennas and tents ready for heading back to Gatwick and onwards to home which wrapped up an amazing trip.